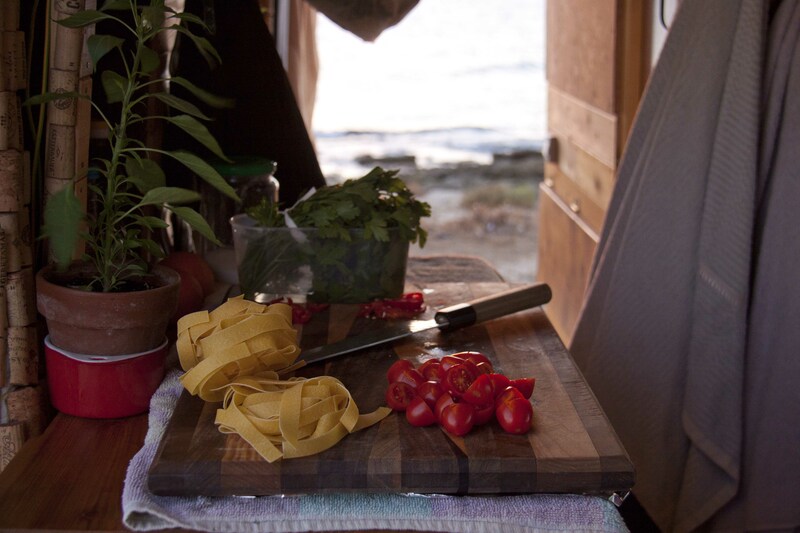 Sicilians are passionate people, and this shows all the way through into their produce and food. We parked the van up on the shores of Milazzo and went for a little walk. 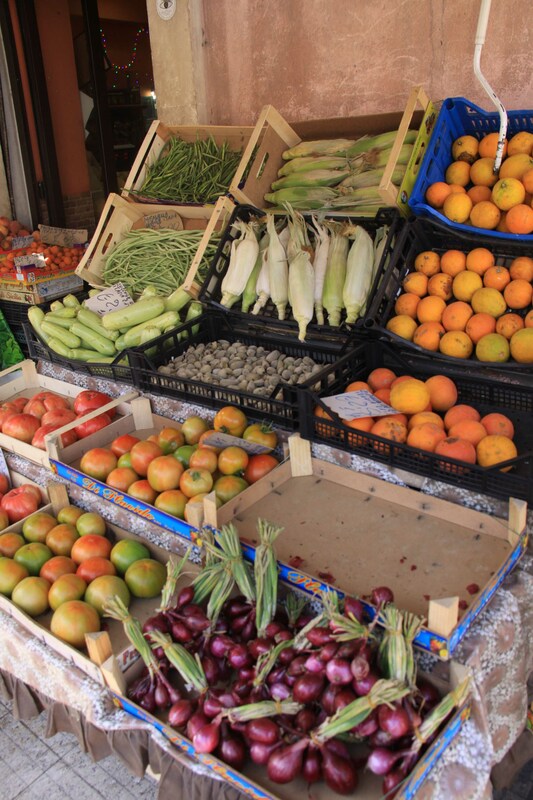 It wasn’t long until we found a fantastic little shop, full of summery gifts from nature; peaches, nectarines, apricots, plums, tomatoes of all varieties, beans, onions…the list goes on, but you get the idea. 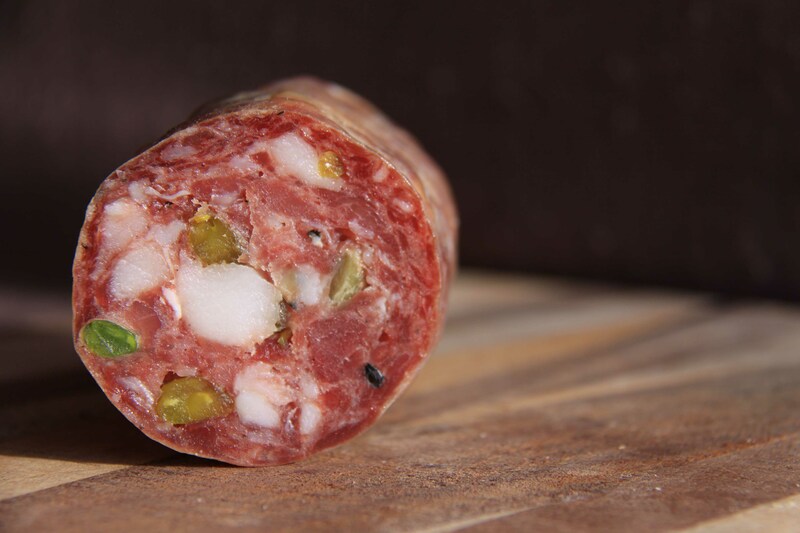 As we chatted away in broken Italian, a pork and pistachio salami got our attention. 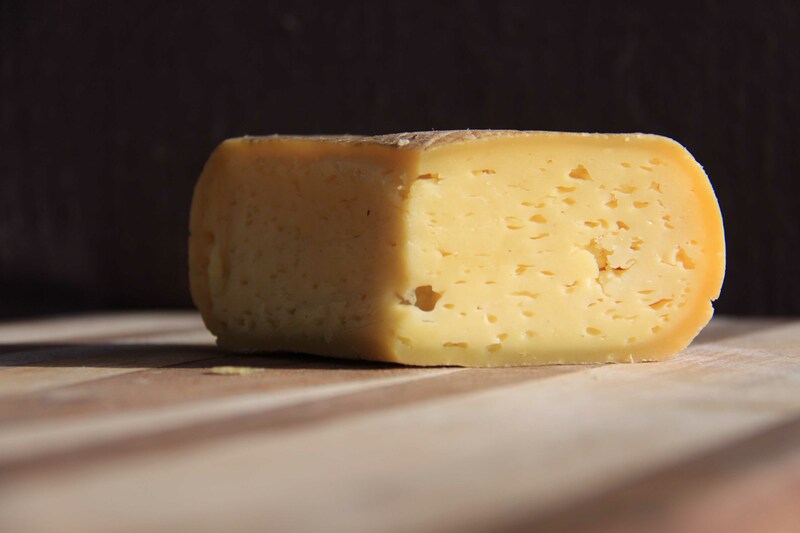 Nicely speckled with fat and bright green slivers of pistachio, we thought we’d give it a try. Fatty and mild with the textural difference the pistachios brought to it, it was pretty awesome! We had read about this street-food place in Palermo so we thought we’d give that a go for lunch. At €0.70 a piece you can’t really go wrong! Mostly deep fried goodies, we tried a good variety; stuffed arancini, crumbed and fried spaghetti balls and mini brioche pizzas were among the little gems we tried. Caponata. 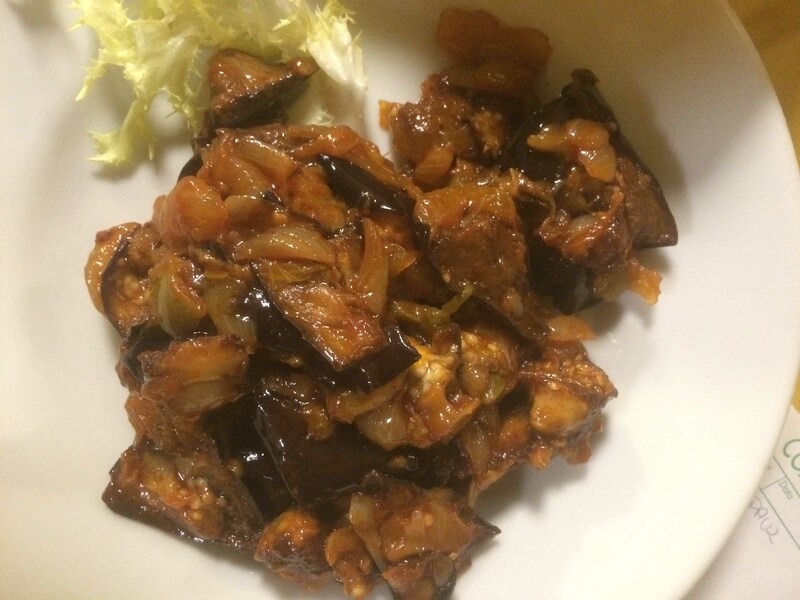 Aubergines are about the only strict guideline on what must be in a caponata. 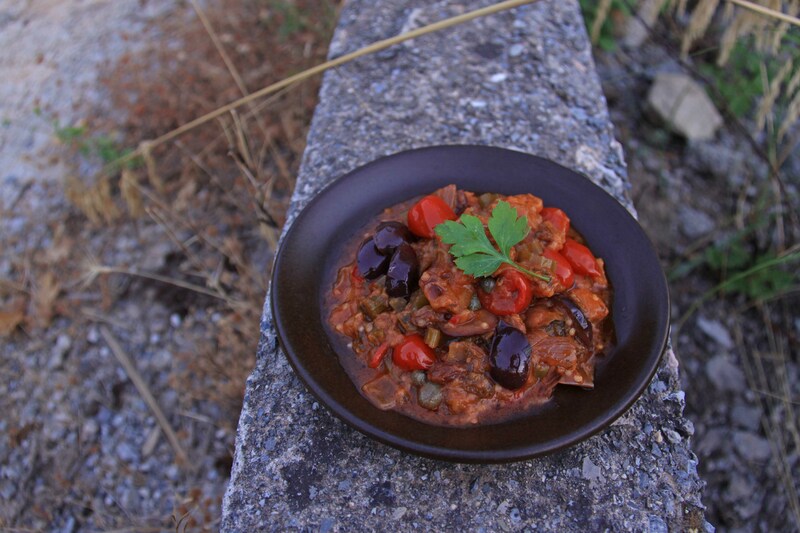 It usually compromise of fried aubergine, celery, onion, courgette, tomato, parsley, chilli, vinegar, sugar and capers. 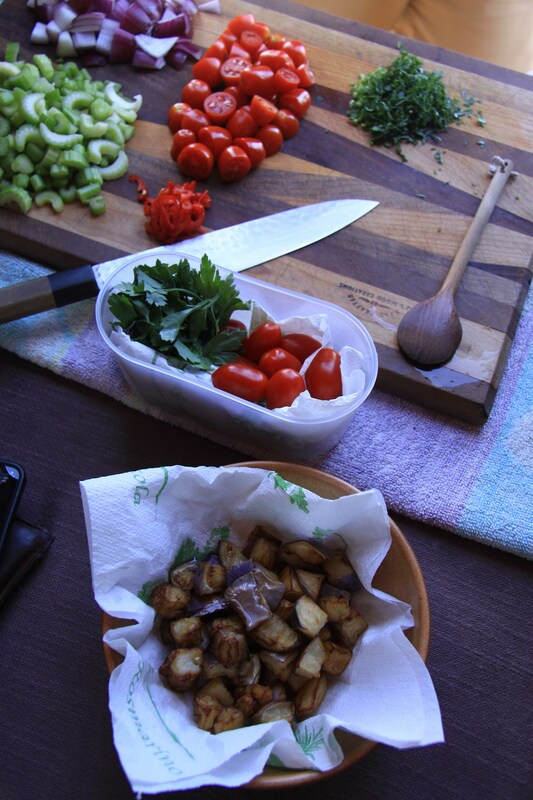 Further down you can read how we made caponata. Bruscette con baccalá mantecato e cardamomo, a simple bruschetta of salt cod with hints of cardamom. 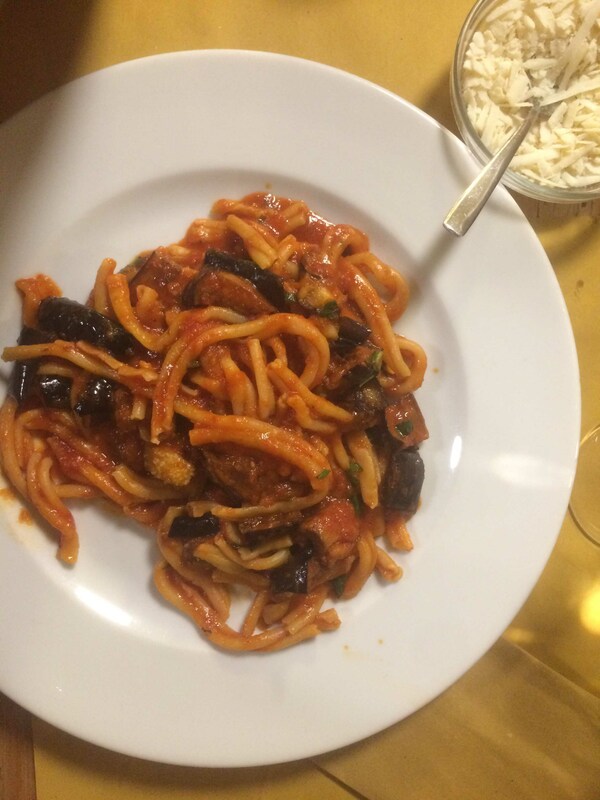 Pasta alla norma. 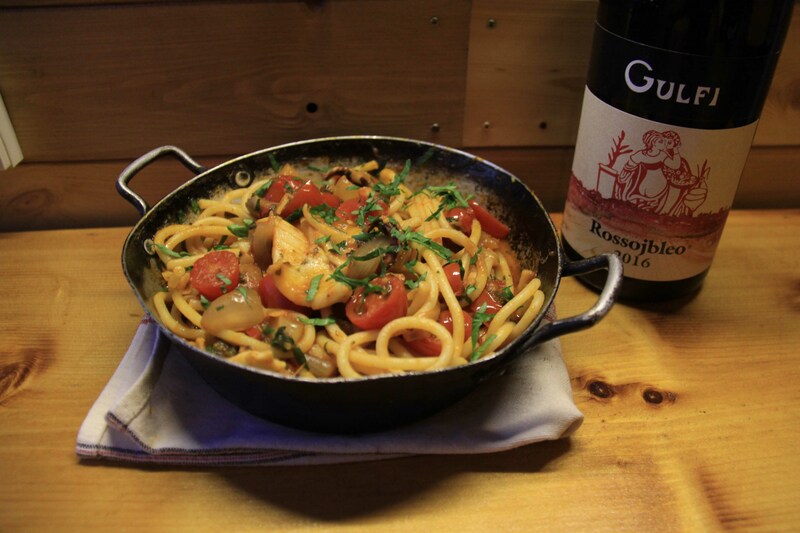 A pasta dish with a sauce of tomato, basil and fried aubergine – they served theirs with the pasta shape of casarecce with a thickly grated side of a hard salty sheeps milk pecorino alongside. Polpette di sarde al sugo. 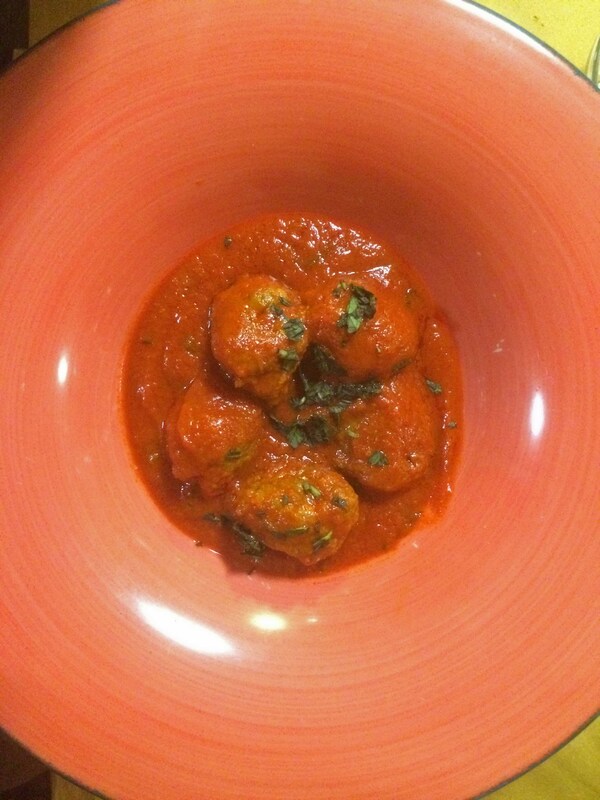 Simply sardine balls in a tomato sauce. Interestingly they serve this with no pasta or starch of any form. A bit strange if you’ve never thought of eating a sardine in a ball, but tasty; intensely sardine-y! 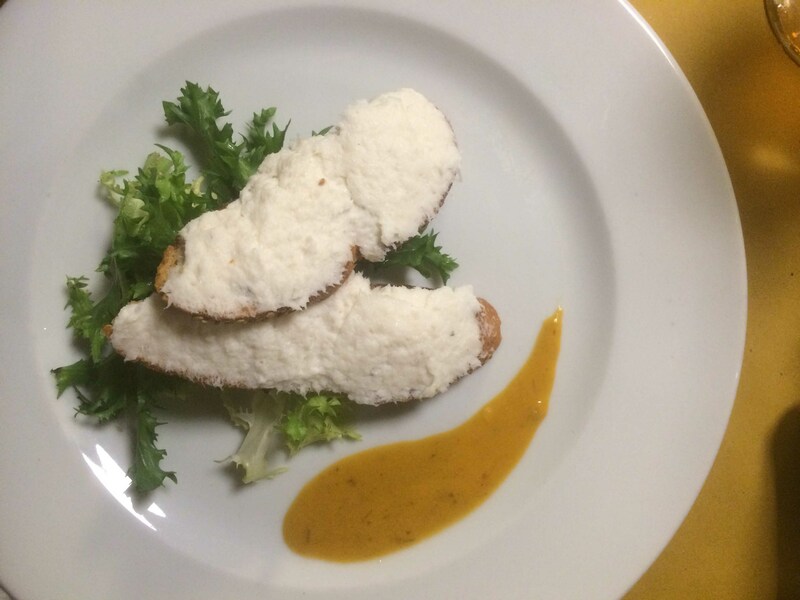 Involtini di pesce spada farcito con verdure. Swordfish rolls served with vegetables. Another classic of this area, although we found this to be quite dry. Cassata was on the cards for dessert (albeit being very full by now! 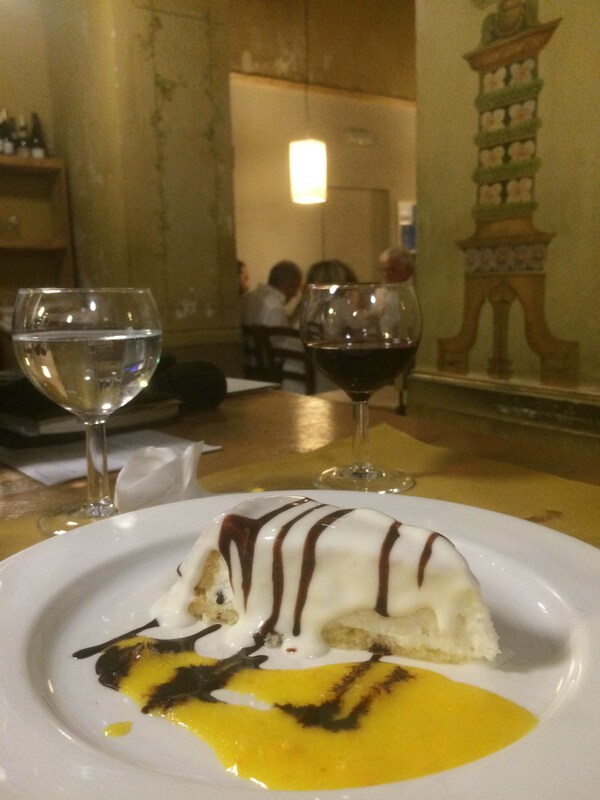 ), a traditional Sicilian cake made with fruit juice or liquor soaked sponge and layered with ricotta and chocolate. We settled into the meal with an aperol spritz, before even looking at the menu – as you do in Italy. The restaurant didn’t have a wine list – which isn’t necessarily a bad thing – so we asked about the house white and red. The waitress explained that both wines were made around Palermo; a classic Sicilian Catarratto and a local Syrah. Happy as, it was done and dusted. Next morning was an early start at the local market for us. Not long after idling down the street we found a fellow selling all sorts of fresh seafood goodies. As we munched on octopus in olive oil and lemon juice and fried squid straight from his large vat of oil, we witnessed the commotion of every day life for these vendors. He would go to acquire his seafood from different people along the street as the others would bring all sorts of different foods to be fried. Quite the trade off they had going! 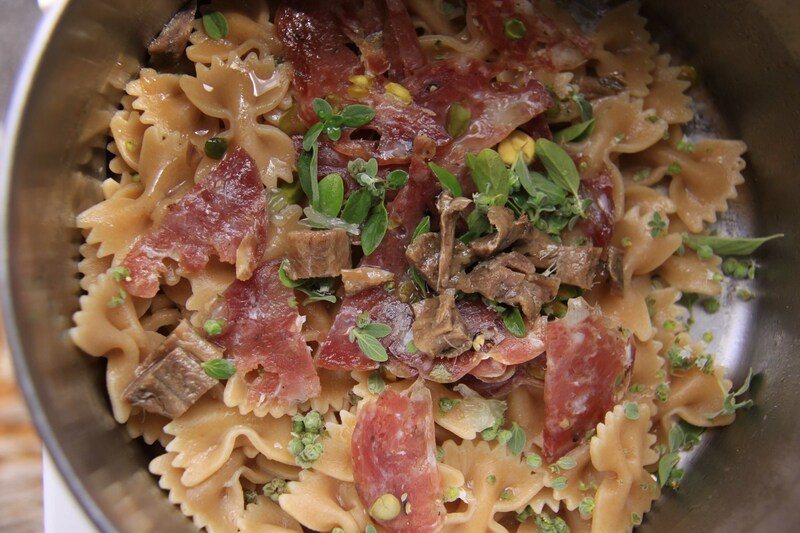 As we made our way around the West Coast, one of the memorable meals we enjoyed was this pasta, using a wholewheat pasta spiral, the pistachio and pork sausage and some beautiful marjoram, anchovies and olive oil. 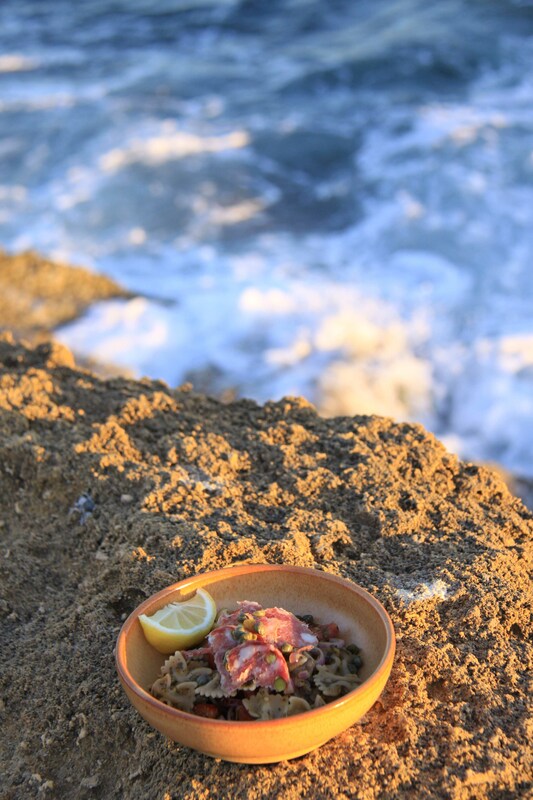 The entire way around the island was full of little stalls selling all the fishy goodness from the surrounding seas. We spent a lot of time looking, scheming and purchasing. 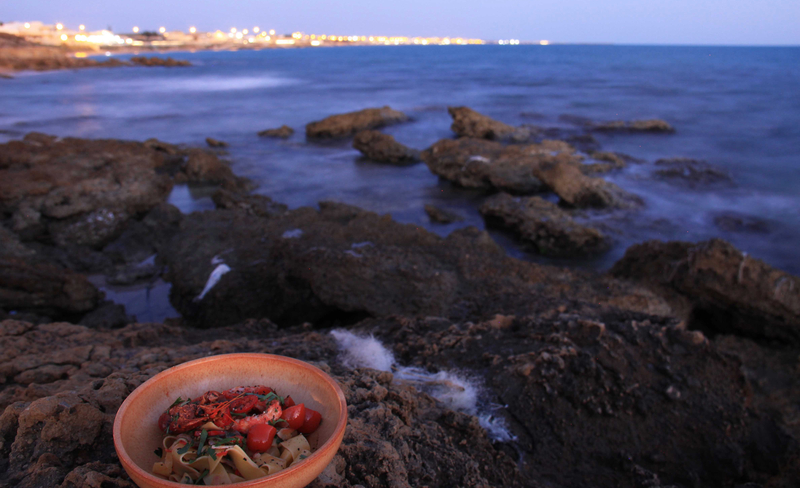 We picked up some red prawns and it was on the wild and slightly isolated South West coast of Sicily that we made a red prawn and pappardelle pasta with Tropea onions, datterini tomatoes, parsley and a white wine and olive oil sauce. 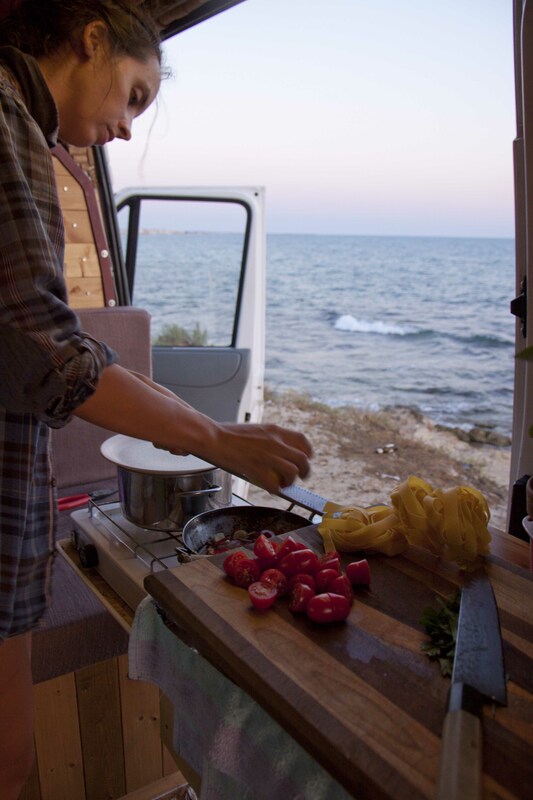 We had dinner that night watching the waves crash on the rocks not 10 metres away. 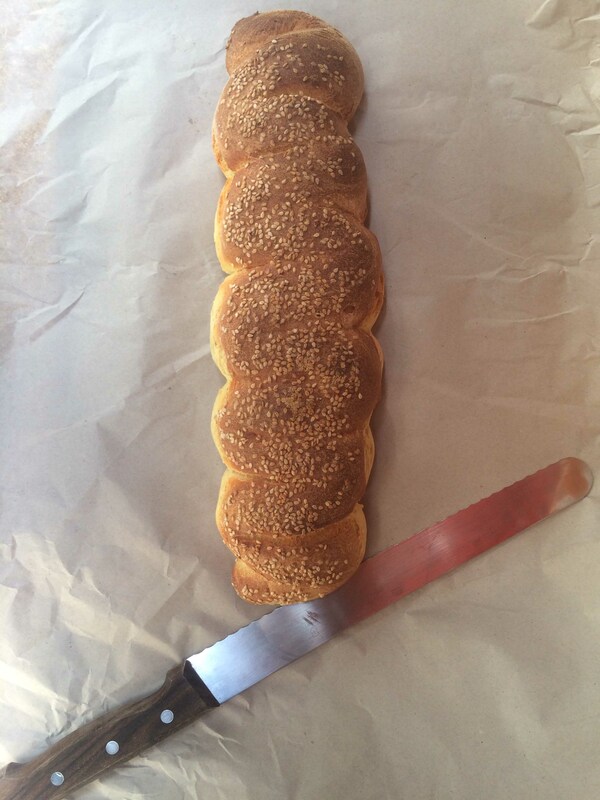 We take breakfast seriously…like lunch, dinner and the in-betweens! 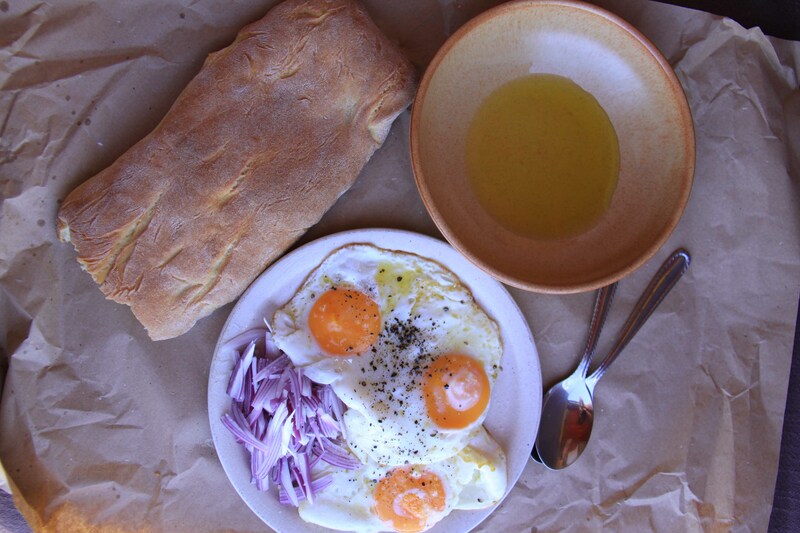 Some breakfasts we’ve enjoyed along the way. 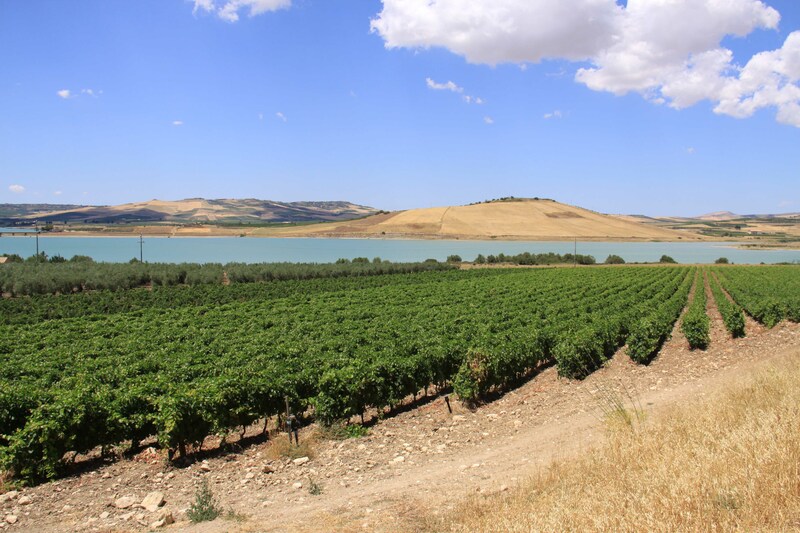 Next up was Ragusa, managing a few stops along the way at some wineries. 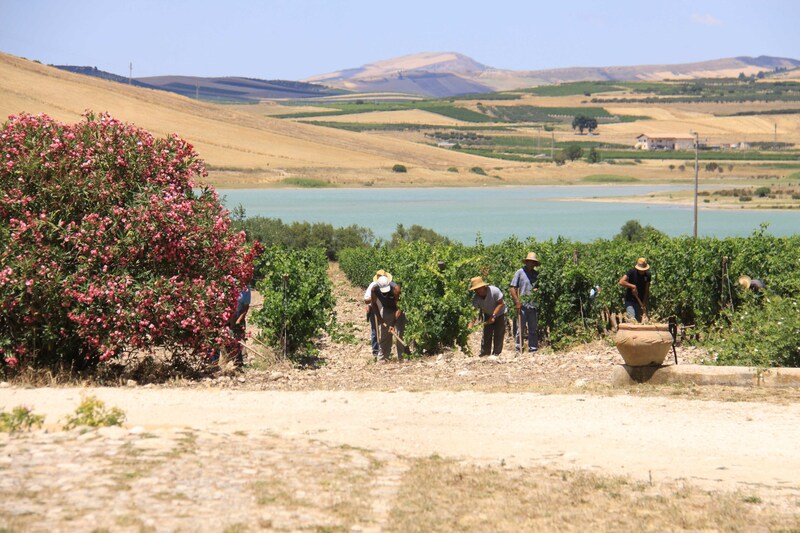 Wine tours and/or tastings are very rarely offered for free around the South of Italy, which is a bit of a shame. Although they all offer handbooks and pretty thorough descriptions, without a tasting you’re pretty buggered. 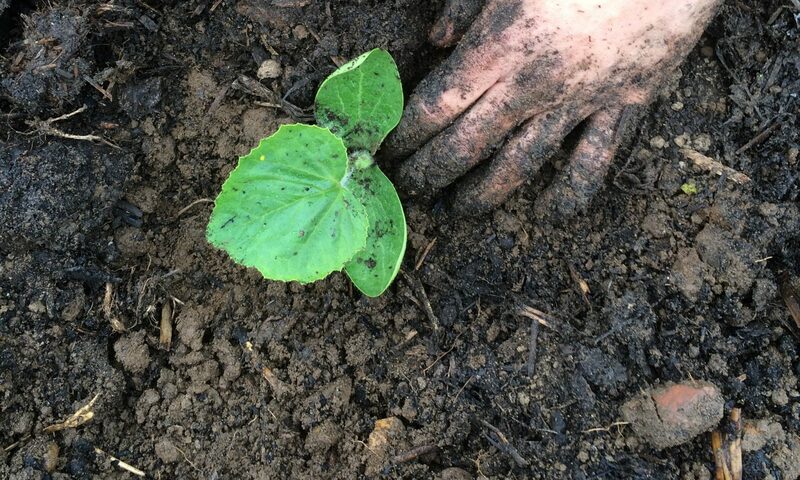 Anyway, instead of tastings, we tended to walk around, ask questions and eventually pick up a bottle or two – mainly choosing native varieties – that we felt we knew enough about to pair well with the food we’re planning to cook. At Planeta winery in Menfi we decided on a bottle of 60% nero d’avola and 40% frappato blend, called ‘Cerasuolo di Vittoria’ (Cerasa means cherry in Sicilian) and a 100% carricante named ‘Etna Bianco’, both pretty young wines. 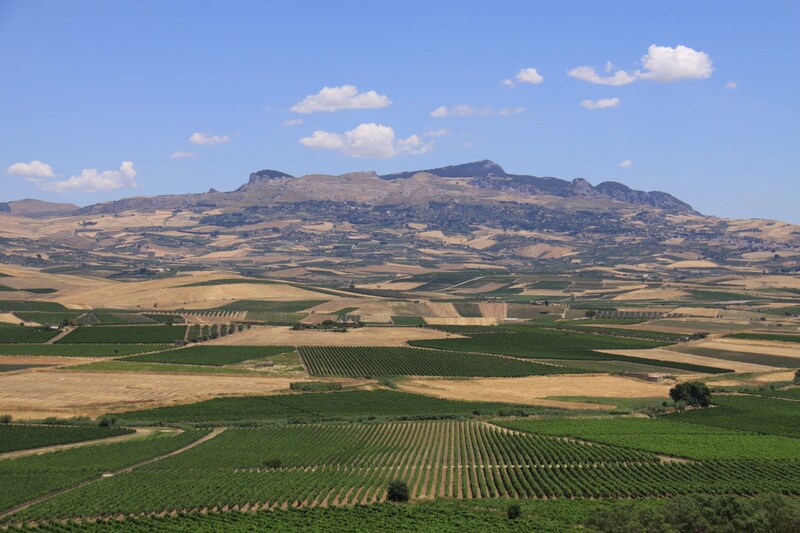 All three grapes here enjoy slight different climates, altitudes and other important geographical factors; nero d’avola and frappato grow in the red soil of Vittoria (south of Sicily) which is more chalky and limey while carricante is soaking in sun high on the north slopes of the volcanic, black rocks of Mount Etna. Planeta Winery also make olive oil, which we did not hesitate to stock up with. Made from a blend of Nocellara del Belice, Biancolilla and Cerasuola olives it is a cold pressed, extra virgin olive oil and complimented many of our meals since. In between the wineries we parked up in a small town where we picked a spot for lunch. The village seemed to be super sleepy, it must have been around 1pm so everyone had escaped from the harsh heat and closed their shutters. 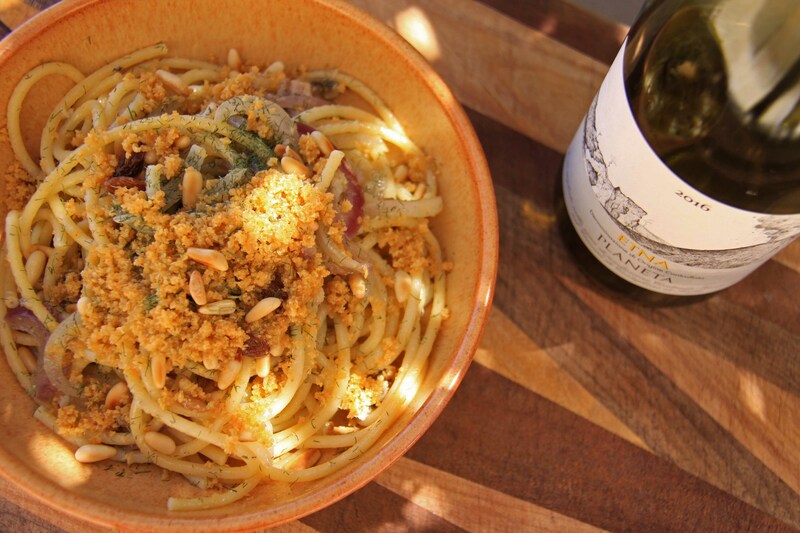 We did the opposite of siesta and made a big bowl of pasta con le sarde each (bucatini pasta, sardines, anchovies, raisins, pine nuts, wild fennel and toasted breadcrumbs) and opened the Planeta white (Etna Bianco) before moving on to further wine-exploration. Spectacular place to grow the grapes! The COS winery visit was short but amazing. The lady that talked to us was very quick to explain she had a group of 70 people coming for a tasting and dinner that night, so it was pretty obviously a bad time for us to show up – no appointment, no phone call; just our style of knocking on the door and smiling awkwardly. Surprisingly (after our bombardment of apologies) she still had the energy and generosity to tell us about the estate and winery and to do a mini-tasting. After tasting four or five wines, we went for an absolutely stunning wine called Pithos Bianco, which is made in a very ancient and uncommon way which you can see what we paired it with here. After it was then onto the famous Gulfi winery, not too far from COS. Look at the beautiful labels and selection of wines they have! We couldn’t resist the temptation to take a bottle of their 100% nero d’avola. It is (for us anyway) a necessity while in Sicily! We were told about a place in Scicli called gli Aromi who specialises in unique and interesting plants that can be grown in the climate Sicily offers. 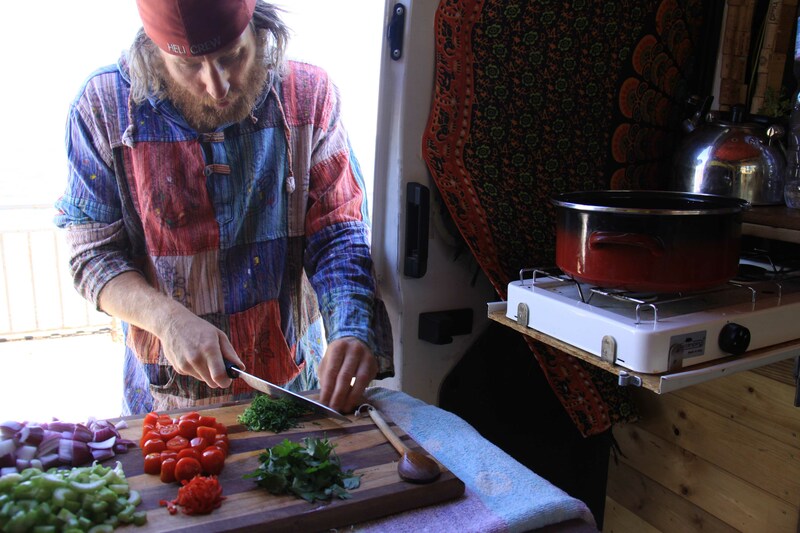 Along with a very impressive lineup of stunning herbs, they offer cooking classes, canapé evenings, yoga classes (which they hold on mats made from thyme), honey and even a small range of cosmetics. We took away with us some wild fennel herb, thyme honey and a marjoram plant. With the delightful marjoram we got from gli Aromi and olive oil from Planeta, we decided on experimenting with an olive oil, elderflower and marjoram cocktail. The result was refreshing and surprisingly good. We didn’t find the town of Ragusa to be overly interesting. Filled with – literally mile after mile along the coast – greenhouses it is an agriculture powerhouse. 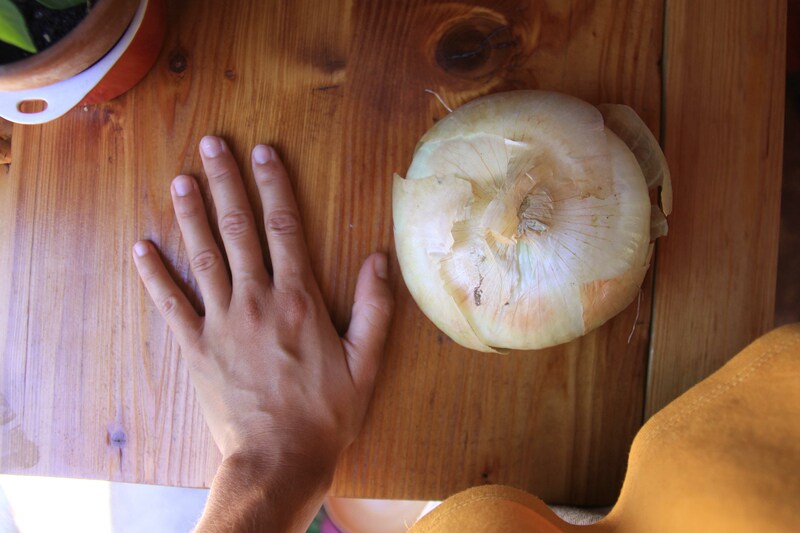 The area is famous for its giant onions. Apparently they can get as large as 2kg! We didn’t find anything this size, but we managed to pick up a couple of very decent sized ones indeed. And some absolutely fabulous capers! Unfortunately, capers for us will never be the same anymore. 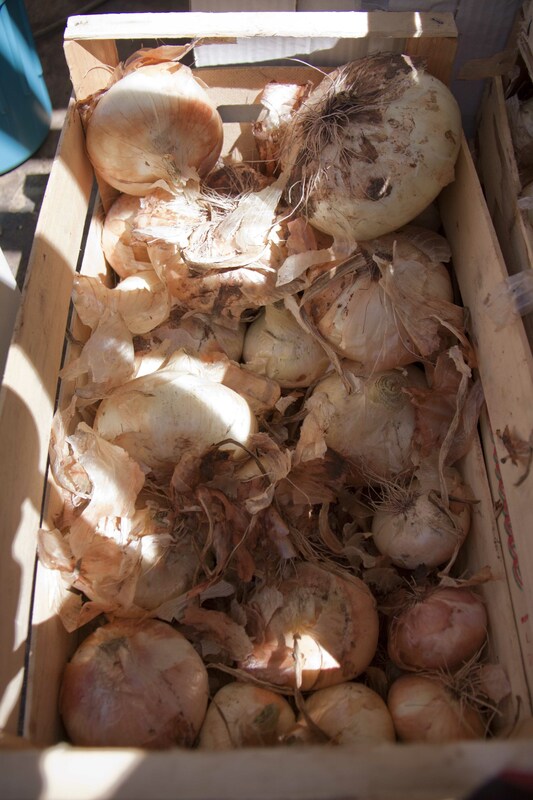 Of varying size, albeit very salty, they were aromatic and, simply, incredible. Our next stop was Catania and the absolutely stunning market of the city that is perched beneath the active volcano of Mount Etna. We have dedicated a separate blog post about that here. 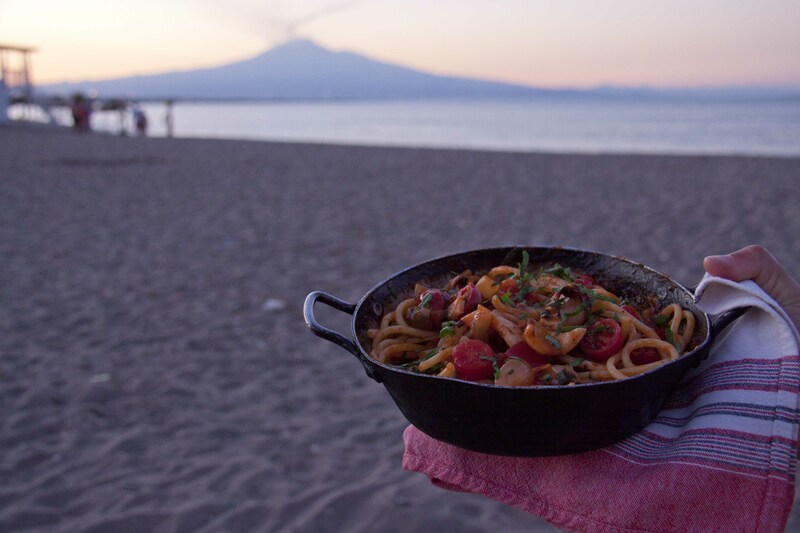 But before we quite made it to Catania, we spent a night on the beach, looking up at Mount Etna and making a cuttlefish pasta with a tomato ragu, red wine and parsley. 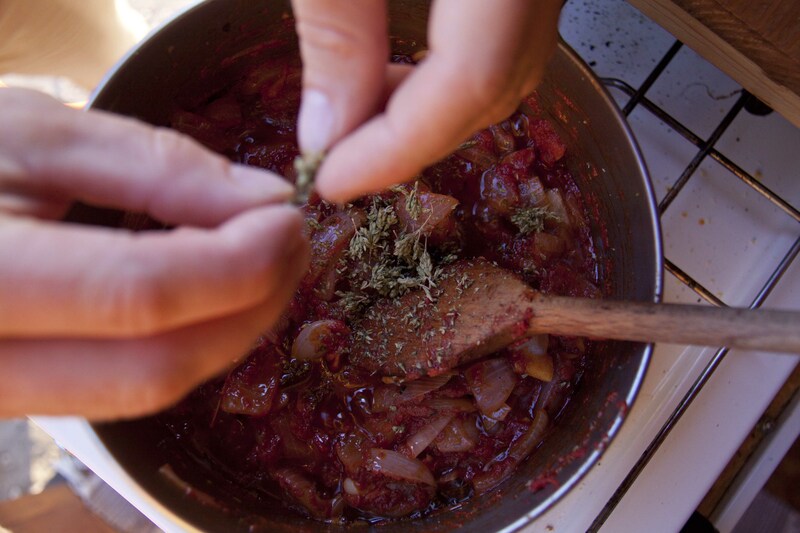 Heading north towards Messina, we made a stop just outside the very beautiful town of Taormina, where we made Caponata; the infamous Sicilian side dish with as many variations as stars in the universe. 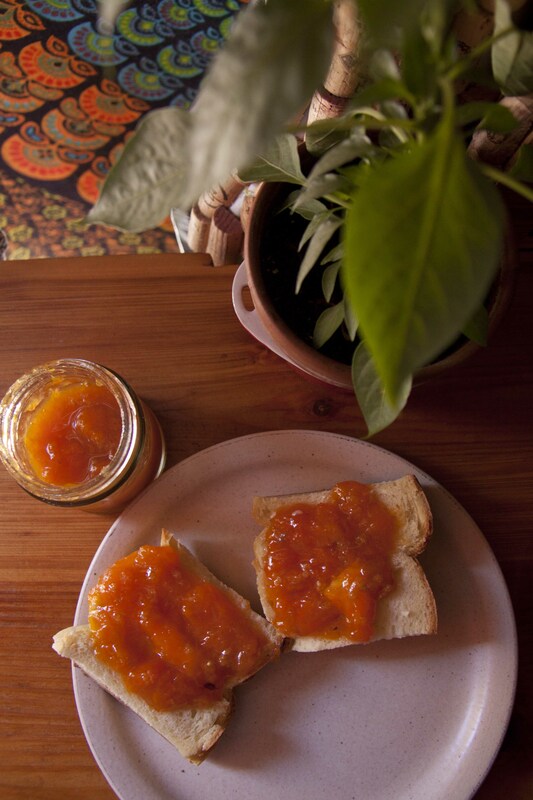 We were very happy with how ours came out; sweet, sour and light but also rich in flavours. Here’s how we made it. Deep fry the aubergines and allow to drain on a paper towel. 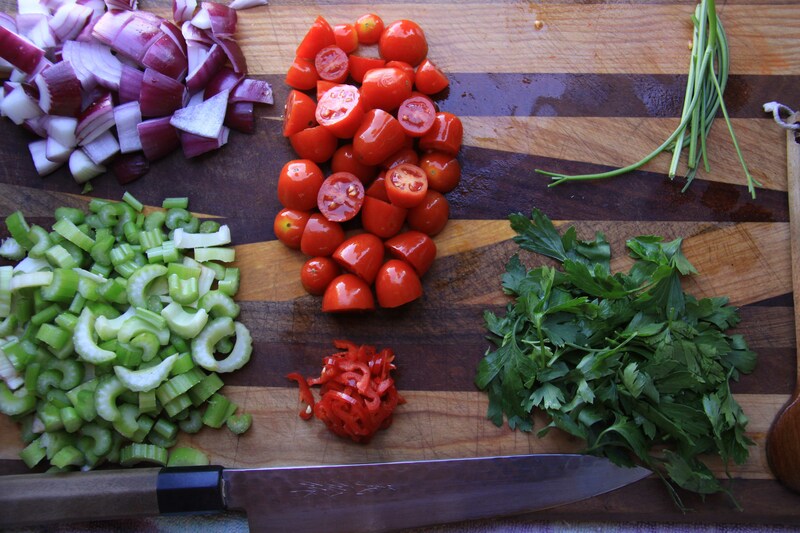 Sweat the onion and finely chopped parsley stalks off in a liberal amount of olive oil. Add the tomato paste and cook out a little, just until it begins to stick. 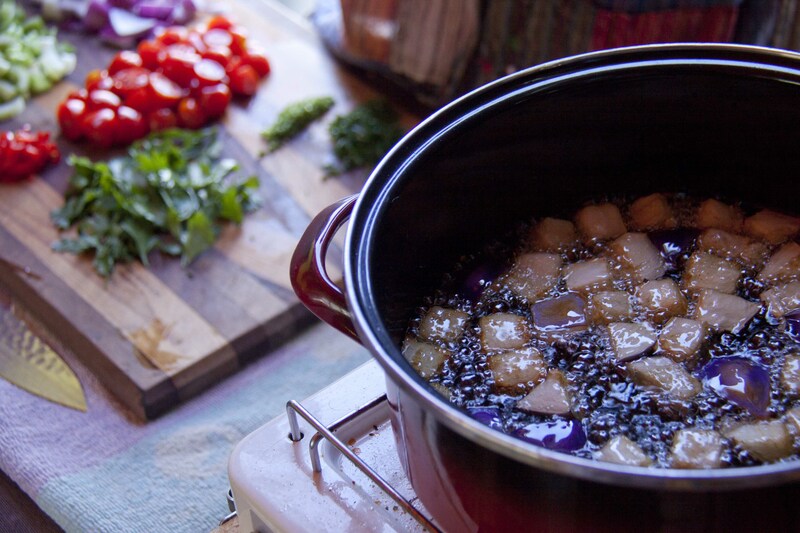 Add the tomatoes and cook out until they break down, releasing some of their liquid. 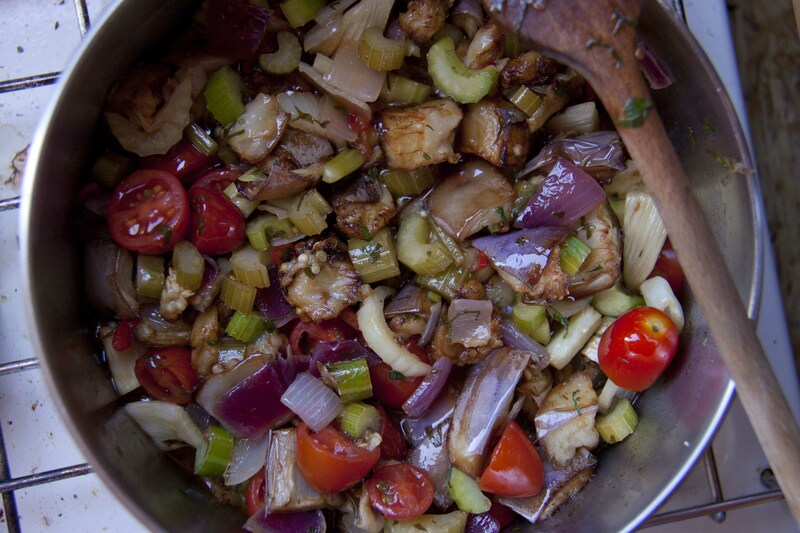 Then add the fried aubergines, fennel, celery, chilli, vinegar and sugar and cook with a lid on until the vegetables soften but aren’t yet mushy, about 40 minutes. Remove the lid after about 20 minutes. Add the capers, olives, sultanas and roughly chopped parsley leaves and allow to cool. Serve at room temperature with some toasted pine nuts and a sprig of parsley to garnish.